Ireland’s working landscape is growing more competitive every day. And businesses across the country have been changing the design of their workplace to provide more collaborative spaces for employees. While open-plan spaces have become a trend in many offices, a number of companies are thinking further ahead: beginning to adapt their management style by breaking down traditional hierarchical structures, and allowing employees to make executive decisions and lead major projects. TheJournal.ie spoke to a number of industry professionals to find out how collaborative workspaces and employee engagement are becoming an intrinsic part of the future of work in Ireland. One global company with a base here that allows employees a significant voice is DHL – Europe’s leading postal service provider. It ensures employees are given a significant platform to voice their opinions and thoughts, on the basis that they rather than managers are the ones who have first-hand dealings with clients on a daily basis. “You’re at a serious disadvantage if you are not confident of your employees’ opinion and actually addressing the feedback you get. Your employees are at the heart of everything you do,” Trevor Murphy, DHL Ireland’s HR Director told TheJournal.ie. Every year, DHL allows its 450,000 employees worldwide to engage in its Idea Management Program, where workers can submit suggestions or project pitches to management level. 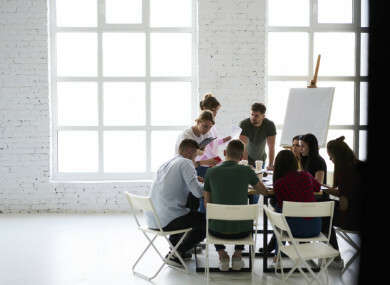 Employees who pitch innovate and creative ideas are then called to work alongside DHL’s board of directors to implement the project across the company. Examples of employee ideas can be found here. “By giving that level of autonomy to our employees, they’re shaping not only the direction of the company, but their direction as a person too,” Murphy said. “A company can be more successful by increasing and improving upon the dialogue that they have with their employees. I would see a limitation for how successful a company can be with a lack of dialogue,” Murphy said. NovaUCD is a research and innovation hub aimed at helping startup companies flourish. Tom Flanagan, director of enterprise and commercialisation at NovaUCD, explained how important collective group meetings are in new companies and businesses that wish to retain creative minds. “If you’re standing and nobody is sitting at the top of the table, everyone is equal in terms of their contributions,” Flanagan told TheJournal.ie. There used to be all these closed-door offices and managers had bigger offices than anybody else, it was very prestige-focused. “The more enlightened office environments have removed all that and they’ve made it more engaging for employees,” he said. Challenging traditional structures within the workplace is becoming more and more important for younger generations entering industries. New talent are eager for a culture of solid communications and collaboration. Like DHL, global technology company SAP, which has a Dublin and Galway hub, is listening to what the top talent of the future are seeking. It too allows employees to make executive decisions. “We’re ahead of the curve, absolutely. There’s no hierarchy,” SAP’s senior HR business partner Kristen Doran told TheJournal.ie. SAP Ireland runs design thinking workshops for its employees, where they are given the opportunity to solve client issues. “That is very much the employees working with management and usually the employees and management are in the design meetings together. Sometimes the managers aren’t even there because the employees want to drive it and they feed the managers their solutions,” Doran said. SAP has a unique manner of communicating between its offices around the world. Each office has a “collaboration room”, which allow employees to talk to each other through screens set up in the room. Each office also had a digital whiteboard, and each whiteboard is connected to the others. “The whiteboard allow people to write down their creative thought process and everyone can see it. That’s quite cutting edge. A lot of companies like the idea, but they haven’t implemented it,” Doran said. Amidst her words of positivity, Doran had a word of warning for companies who have yet to implement this flat structure within their workplaces. It takes a mindshift change because it moves away from a top-down approach to being more open to being led by what the greater population believe. You really have to take it seriously. Whenever the term “the future of work” arises, along with it comes discussion of a better work-life balance. Like DHL, SAP also runs employee engagement surveys to figure out what changes staff want to see within the company. Doran told TheJournal.ie that one almost unanimous suggestion that arose from the company’s sales sector was the implementation of more flexible working hours. “They were so strong in their stance that management had no choice but to accept it,” Doran said. Employees now have the option to work from home for a number of days throughout the week if they wish to do so. Suzie Rogers, HR business partner with SurveyMonkey, was the last expert to weigh in on the future of work in Ireland. The company has an office in Dublin with about 50 employees. It has over 700 employees globally. Rogers believes firmly that the availability of a flexible work-life balance will be vital for any company looking to survive and thrive in Ireland over the next few years. “The mentality came from our late CEO David Goldberg who said he would always make sure he would be home to have dinner with his children at 5.30pm,” Rogers said. In 2016, SurveyMonkey introduced a number of family-friendly policies to make sure its employees can prioritise family when they need to. For example, in addition to unlimited paid time off for staff who have been at the company for over a year, SurveyMonkey introduced extended parental leave of 16 weeks for both mothers and fathers. People are more educated about work-life balance and what it means. Companies that don’t embrace that and start to be more innovative in the way they do things are going to lose top talent. Particularly in Ireland where it’s extremely competitive in the war for talent. Tom Flanagan of NovaUCD agreed. He said UCD staff have a policy not to arrange meetings before 9.30am or after 4.30pm, to allow people with families to make childcare arrangements. Looking at the future of work in Ireland as a whole, Flanagan had a very positive outlook. “I see the startups, I see the engagements and I see the global focus that they have. They’re on a global scale and that’s exactly where we need to be. We need to keep that high-energy attitude to the work that we do,” he said. In her final words with TheJournal.ie, Doran chose to offer a snippet of advice for companies that have fallen behind – companies that are operating in the present as opposed to the future. “You’re not getting the maximum engagement out of your workforce because when people believe their voice is being heard and when they see that, tangibly, their suggestions and direction is taken onboard then you have much larger engagement,” she said. All in all, it’s safe to say that Ireland’s working landscape is developing at a faster pace than ever before – but embrace it, don’t fear it. Engage with your employees, engage with your management. The future of work in Ireland is creativity, innovation and collaboration. Email “The future of work: How these Irish workplaces are ending the era of the boss”. Feedback on “The future of work: How these Irish workplaces are ending the era of the boss”.